There is delightful murder in the air at the Buell with super musical comedy. At the beginning of his story, Monty is a penniless young man in the Clapham area of London. His mother has just died, and he is living in somewhat shabby conditions. He doesn’t have money, but does have an abundance of charm. He is smitten by Sibella, a socialite who finds Monty interesting, but way below her desired station in life. She is ready to marry handsome man who will give her money and status, but not much else. A mysterious family friend, Miss Shingle, turns up at the flat and tells Monty that he is actually heir to a wealthy estate in England. Being an “heir” doesn’t present the immediate wealth desired, as he is reportedly ninth in line to the D’Ysquith family fortunes. He presents himself to the family’s financial leader who rebuffs him, and claims he wants nothing more to do with him, denying that Monty’s mother was a family member cut off from the group. Monty visits the family’s Highhurst Castle, where the D’Ysquith ancestors’ portraits encourage him to find his place in life among them. Only problem being the eight living descendants who are in line ahead of him. They are an unusual brood of aristocrats. Could it be possible for Monty to take them each to task, taking him to the family title and money? Denver Center_National Touring Company. 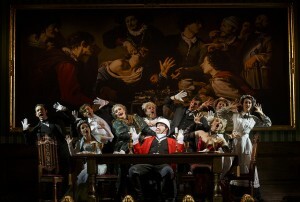 The cast with John Rapson as Lord Adalbert D’Ysquith (red) in a scene from “A Gentleman’s Guide to Love & Murder.” Photo credit: Joan Marcus. The National Touring Company of this zany story is at the Buell Theatre until the end of the month. They are a talented group, headed by Kevin Massey as Monty, Kristen Beth Williams as the seductress Sibella, Adrienne Eller as Phoebe D’Ysquith, the sister of one of the heirs. And John Rapson who has the wondrous opportunity of playing all eight of the soon-to-be deceased D’Ysquiths. He is super as a reverend, a banker or two, a weight lifter, even as a wealthy aunt in need of a cause. It is Massey as Monty who weaves his tale of mayhem. Massey is a gem. Stephen Sondheim wrote the lyrics for “West Side Story” having Maria confess, “It’s alarming, how charming I feel.” In “Gentlemen’s Guide,” Monty looks and acts disarmingly charming as he plots his next murder. No evil is apparent, just a down-on-his-luck chap wishing to take his rightful place in the family tree. He isn’t angry with any of his victims, just wants them out of the way. Staging is excellent, as a stage on a stage provides Monty with the set to put his activities into motion. There is the colorful ice skating sequence where Monty cuts a hole in the pond instead of using the “poison in his pocket.” A kindly reverend gets blown from atop a church when a sudden gust of wind, and perhaps a little push from Monty, causes him to tumble to his death. There is the bee-keeper who is chased to death by the bees he keeps, the weight lifter who loses his head when too many pounds are added to his weights. Surely audiences haven’t been provided with so much fun while observing murder after murder – all to put Monty in the rightful line for the family fortune. In early Act II Sibella and Phoebe turn up in adjoining rooms of Monty’s apartment, each claiming love for the now-wealthy Monty. The “I’ve Decided to Marry You” rendition is among Broadway’s most delightful sequences in many-a-season. As most of the family has been dispensed with early-on, the second act doesn’t maintain the earlier murder madness. An unfortunately long scene at a family dinner late in the show slows the pace even further. The overall production, however, remains a jewel. “The Guide” was several years in the making before opening on Broadway in November of 2013. It received the Tony Award as Best Musical, and repaid investors in full within 18 months. It closed on Broadway just this past January. This is not a chorus-line type musical with enormous musical sequences, but an “alarmingly charming” evening of extremely clever lyrics, sensational music, and a set that provides non-stop delight. 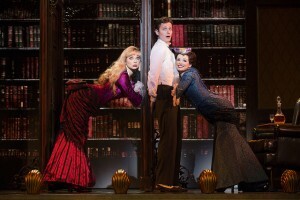 “A Gentleman’s Guide to Love and Murder” is a rollicking romp. One critic noted that the show is “morbidly hilarious.” I wish I had coined that phrase myself!